The Smart Jet Black Premium Ink 82770 has a blacker dye, better adhesion, and slightly faster dry time than the current solvent ink, 82706. RibType is an economical stamping system manufactured with an interlocking rib system. The letters, numbers and characters have ribs on the back that interlock with the receiving ribs. Many devices use this system, such as Metal Self Inkers, Wooden Handles, Rocker Mounts and Roll Printers. Marsh PS tapers provide smooth performance under pressure. Pack Secure is an approved distributor for Marsh Products. MSSC has introduced two new Inkjet Printers to join the Smart-Jet product family. These printers, the Smart-Jet Glide and the Smart-Jet Handheld can be wirelessly connected to Android devices and provide flexibility for various projects. Marsh manual Water Activated Tape Dispensers come in a variety of models. Featuring an easy-pull handle for variable tape lengths in a single pull, the Marsh TDH is no frills, all performance. 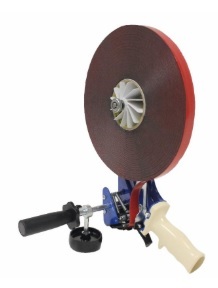 Drop-in tape loading and easy-pull snap-back handle provide a no hassle operation. Children can grab things in a second. Give yourself some peace of mind with these child resistant stand up pouches which are labeled with instructions for adult use only. 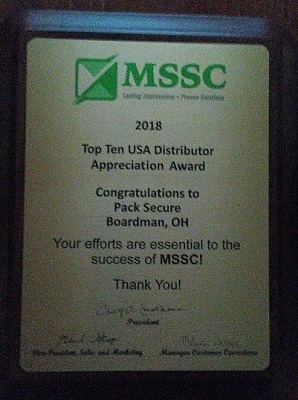 Pack Secure has received another Top Seller Award from MSSC. The model 920 Very High Bond tape dispenser has the ability to utilize double sided, single sided, or acrylic foam tape up to 20 mm wide, 1.5 mm thick and 320 mm in diameter on a 3" core. At MSSC, we value our customers and their feedback. We are committed to constantly improving our products so that our customers get the best value for their money. Below are the enhancements we have made to the electric tape dispensers to make them more reliable than ever. Nelson Wrap Dispensers have revolutionized the pallet wrapping process. Businesses that ship tangible products all run into the same quandary: How do I ship my product with the most efficiency and lowest cost? Negotiate the best price that you can with your freight company. Get the best possible price on packaging and shipping materials, consider buying in bulk. Buy quality, sturdy, lightweight materials for shipping your product. Your shipping station should be set up for maximum efficiency. Take the time to classify your packages and enter the proper dimensions to get the most accurate shipping cost. What is an Impulse Sealer? How does it work? Why do you need one? How do I fix my Impulse Sealer? If you're experiencing problems with your impulse sealer, please go through the following troubleshooting steps to help determine the problem. Why You Should Read the Manufacturer's Stamp on Your Cardboard Box? Each manufacturer will use a certified stamp to indicate the specifications of the cardboard box. When branding your shipment, be creative. Make receiving your package fun and memorable. Stenciling can be a complicated process, but is made easier with the use of Stencil Machines. Stenciling is used in many industries to mark products, pallets, signs and much more. Choosing the right sealer is just as important as choosing the correct plastic for your job. When deciding on which sealer you need, consider the plastic you will be using for your project. Do you need a strong plastic, food grade type or just need a clear plastic for presentation? Once you decide on the plastic you will be using it is time to choose your sealer. Stretch Wrap: Blown or Cast? Cast Stretch Wrap is more cost effective and clearer than Blown Stretch Film, but does not have the hold power that Blown Stretch Film has. Document Envelopes are perfect for your important documents. Rubber Stamping can be used in your every day business and personal life. When using a rubber stamper you apply ink, paint or dye onto a rubber sheet, which has been altered to create your desired message. This message may be an image, pattern or even words and letters. The altered rubber sheet is then adhered to a block, wooden handle mount or perhaps a self inking device. Evolution on Color Matter, Ink and Marking Devices. When choosing the proper packaging for the items you need to assess the materials being packaged. Consider the shape, weight and solidity of the items when deciding which packaging would be best for the job. You want your completed package to be sturdy and labeling to be visible for whatever may happen on its journey.